This item is one of Ken's Picks. "Bright and bold, this brilliant bootie in outrageous orange makes everything you wear extra exciting and worth a second look." 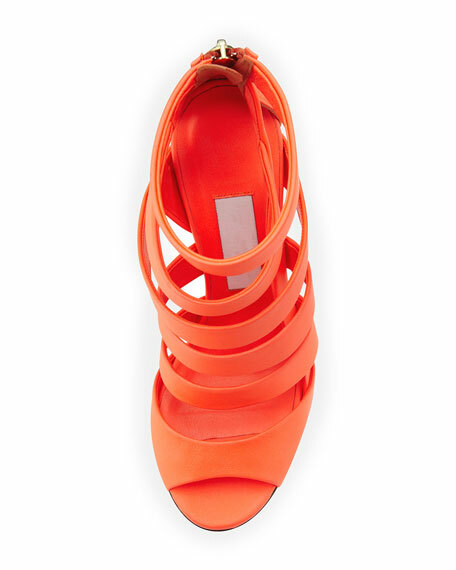 Go brightly in this Jimmy Choo neon orange sandal-bootie. "Dame" is made in Italy. Launched in 1996, the inherently chic Jimmy Choo collection has earned a loyal following among Hollywood's glamerati. Today, the collection includes luxurious handbags in addition to its coveted shoes, all of which are crafted with attention to detail and inspired accents.